Mohammed Al Balooshi’s ground-breaking appearance at the Dakar Rally may have ended in broken bones and frustration, but the UAE motocross star is back in training and aims to settle “unfinished” business when he makes his return at next year’s race. In 2012, Al Balooshi became the first UAE national to compete in the motorbike class of the world famous Dakar Rally. Unfortunately, the Emirati’s campaign did not have the glorious ending he would have hoped for when on Day 10, having thrust his way from 130th position on Day One to 43rd, he crashed his bike over a three metre unmarked cliff, resulting in a broken collarbone and wrist. Despite his debut Dakar Rally ending in disappointment, Al Balooshi is determined to compete in next year’s race and is already training hard in anticipation for his return. Al Balooshi will start testing his race bike in September, but in the meantime, is on a strict fitness regime, which includes five days a week on the road bike, 35 km of running, and endless hours in the gym. 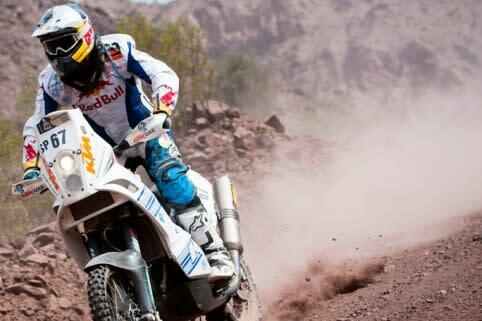 “Dakar was the race that had the biggest impact on my career,” the 32-year-old said. “It’s a race I have literally dreamt of. Due to the injuries he suffered during his maiden Dakar Rally, Al Balooshi is viewing his second race as a way of taking care of “unfinished” business. “With the crash and the injury I sustained the last time I participated, I feel like Dakar is a chapter in my life that was left unfinished,” he added. Aside from becoming the first Emirati motocross star to compete in the Dakar Rally, Al Balooshi has enjoyed a decorated and successful career. He currently holds the Arabic Motocross Championship title, the Bahraini Enduro title, and is the Qatar Motocross Champion. Al Balooshi also runs his own MX academy where he trains and nurtures talented up-and-coming riders.